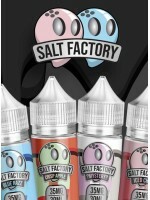 Salt Factory - Strawberry Kiwi 30mL This artful blend of sweet fruit and taffy candy presents a..
Salt Factory - Berry Rush 30mLThis succulent blend of berries features a wicked whammy of all your f..
Salt Factory - Melon Lush 30mLA deliciously wild blast of lush melons. Watermelon, Honeydew? In..
Salt Factory - Limited Edition Mint 30mLNothing is better than a refreshing sweet arctic mint. Cool ..
Salt Factory - Iced Chee 30mLIced Chee by Salt Factory eLiquid is a juicy lychee and exotic fruits f..
Salt Factory - Crisp Apple 30mLCrisp Apple by Salt Factory E-Liquid is a sweet crisp apple blasted w..
Salt Factory - Blue Razz 30mLBlue Razz by Salt Factory eLiquid is a gushing blue raspberry taffy tha..
Salt Factory - Mystery 30mL?Mystery? by Salt Factory E-Liquid is a sweet taffy mystery that keep you..